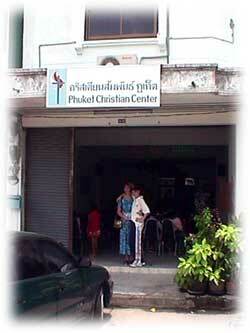 Phuket Christian Centre was founded as a Church in fellowship with the Thailand Assemblies of God. Rev. Preecha Saengkong (Thailand), Rev. Bruce Mumm (USA) and Rev. Brian Burton (UK) joined together to initiate the church plant in 1990. 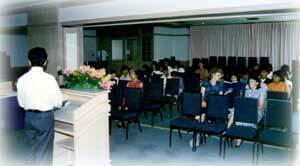 The first meeting was held on 1st April, 1990 at the City Hotel, Phuket. 34 people attended and Rev. Preecha spoke from John 3:16. On August 1st, Brian & Margaret Burton moved to Phuket to give their full attention to the church plant. The church was relocated from the City Hotel to a small rented building in Nimit Rd. In September the Burtons took full responsibility for the church as Rev. Preecha had to return to Bangkok due to ill health. By the end of 1990 the church had grown to about 15 regular members. 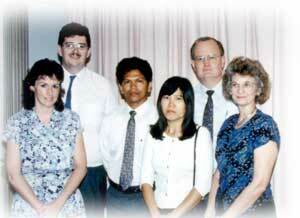 In 1997 we started an International Church, at first meeting once a month at the Thavorn Palm Beach Hotel. 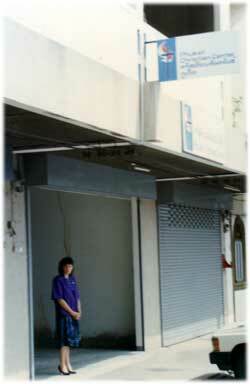 In October, 1999 the church bought a larger property, still on Phunphon Night Plaza where we are currently located. Our congregation grew to over 100 people. During this time the International church grew and began to meet regularly on Sunday evenings at the new building in Phunphon. Also during this time the Church began to be active in the community. Firstly, through our New Life Project, helped financially by World Christian Ministries based in the UK, and Asia’s Little Ones, based in the USA. We have also helped poor and needy children in conjunction with the Thai Social Services. Over time this grew into the New Life Foundation, and we continue to reach out to help those in need. Following the Tsunami of 2004 we were involved in helping tourists who had lost families in the disaster, and also worked in the many refugee camps all along the coastal areas helping the Thai people who had been affected by the disaster. Many individuals, schools, churches and other groups responded generously to our worldwide appeal, which led to us being able to rebuild 2 schools, one in Kamala here in Phuket and the other in Thai Muang on the mainland. Our work during the Tsunami also led us to the Morgan people, whose island had been completely washed over by the wave. There is now a thriving church on their island, which is visited every week. Alongside this we were able to build Sussex House, our children’s home, with funds raised by the British Police Force in Sussex, England and others in the UK. Over the years we’ve been able to help many children, from small babies through to teenagers, in order to give them a good education and better opportunities in their lives. In early 2010 we discovered that a group of people (28 families) were squatting in the decaying remains of emergency housing built at the Tsunami refugee camp of Baan Nam Khem, on the Thai mainland in PangNga Province. Somehow they had never been helped or re-housed. In response to their desperate need, PCC started by renting an acre of land large enough to build houses for all the families. Houses were built and for the first time these people had their own homes. As a result of this blessing, most of these people have already come to know Jesus as their Saviour. Phase One of this project was completed due to help from the PCC congregation and donations received from friends and churches overseas. Phase Two was then begun converting temporary wooden structures to more permanent brick buildings. Another group of people the church works closely with are the Urak Rawoi, a sea gypsy group, living by the coast here in Phuket. With the help of Renewal Christian Centre, UK, boats were purchased to help them become self-sufficient and maintain a better lifestyle for themselves. We meet regularly with them once a week, and they’re often seen in church on Sunday wearing their Wolves shirts – kindly donated by Pastor Brian’s football team – Wolverhampton Wanderers! Another by-product of the Tsunami was the joining of the Thai and English services to form a Sunday morning bi-lingual service. Other significant things were happening that would drastically affect the church. In 2007 Pastor Brian and Heidi Gempel attended the International Institute on Nation Transformation in Argentina. The teachings of Ed Slivoso had an immediate impact and on his return to Phuket, Pastor Brian started to teach about Nation Transformation. The church began to grow rapidly and under the current system we desperately needed a larger building for our Sunday worship service. Phuket Mayor, Paiboon Upatising, who had joined the church, took Pastor Brian to see the largest nightclub in Phuket town, The Planet, and it was decided to rent the building for our bi-lingual Sunday morning services. 2010 saw us move into a number of different locations with the main Sunday service back in the Phunphon premises. We now have regular meetings throughout Phuket and in several places in Phang Nga province. Pastors Brian and Margaret Burton, are also involved in Harvest Evangelism, headed up by Rev Ed Silvoso, the Founder and President. This has led to many ministry opportunities worldwide preaching and teaching on nation transformation, and also being a part of the International Institute on Nation Transformation conferences, now held in Hawaii. On top of that Regional Transform Our World Conferences have started in a number of nations, the one in Phuket now being an annual event. PCC hosted the first Transform Our World conference in Phuket in 2009 with Dr Ed Silvoso as the guest speaker. We have continued to host them each year and have welcomed faculty and delegates from various countries such as Hong Kong, Philippines, Singapore, Malaysia, Hawaii, Japan, Mexico, England as well as from all over Thailand. In 2011, for the first time other Phuket transformation churches joined PCC to co-host the conference. Also, for the first time we received local government funding to help cover the cost. In August 2012 the 5th Phuket Annual TOW Conference was hosted by Harvest Evangelism, the Phuket Administration and the TOW Phuket Committee, welcoming a faculty and delegates from all around Asia and other nations of the world. For the first time in a city in Thailand, churches closed their doors on Sunday 5th and came together for a joint worship service at the conference venue.